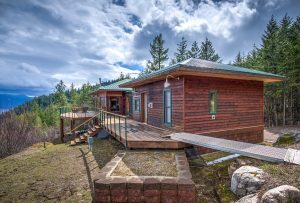 Stunning views included with this 2 bedroom private mountain oasis in Sagle, North Idaho! 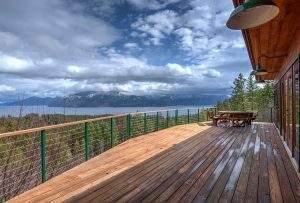 Both 6-acre parcels are included and border USFS with views overlooking beautiful Lake Pend O’reille. This retreat is well-appointed with custom details and quality craftmanship throughout. 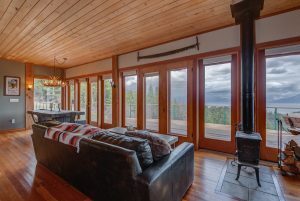 Gleaming hardwood floors, granite countertops, quality Anderson windows – all in a layout to maximize views, entertaining, and living the good life! Play in the thousands of forested acres extending beyond your property line, or explore the lake from the boat launch just moments away. Living is easy – and comfortable – with radiant floor heat, multiple stoves, and 20 KW automatic backup generator – plus a 1000 gallon propane tank! During the summer you’ll spend a lot of time on the huge deck – soaking it all in!